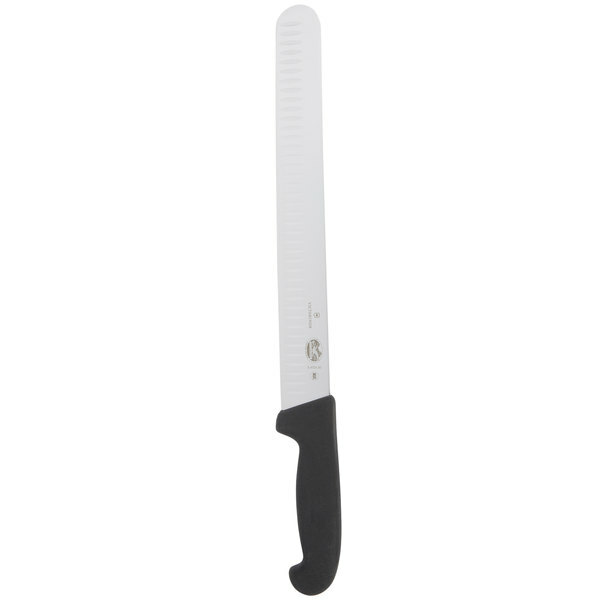 Cut meats with precision with the Victorinox 47645 12" slicing knife with granton edge and Fibrox handle! While this knife's straight edge is perfect for slicing roast beef or carving a turkey, its 12" long blade allows you to simply cut through large pieces of meat at one time. This knife is perfect for cutting meats in restaurants and catering kitchens and is an ideal addition to your knife collection! "This is one of the best slicers I've used over my the fifteen years in the kitchen. All of Victorinox's knives are a great buy." The durable, black, slip-resistant Fibrox handle's contours ensure that the knife will fit comfortably in your hand as you tackle daily food preparation tasks. Crafted from high-carbon stainless steel, this knife's blade is built strong to provide you with the ability to create smooth, accurate cuts. 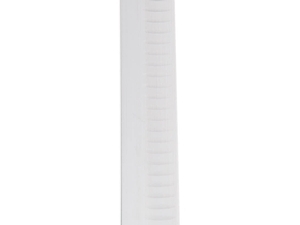 The high-quality blade won't even discolor or corrode over time. The granton edge provides easy slicing by creating small air spaces between the product and the knife. These air spaces allow for any juices to freely pass to the surface for a cleaner more professional looking cut. What's the best way to clean this utensil? While this utensil is dishwasher safe, to extend its life and reduce potential rust issues caused by repeated cycles through a dishwasher, hand washing is recommended. 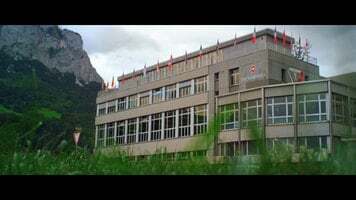 Take a look into the eco-friendly factory of Victorinox! They produce excellent tools from an innovative factory that has been around for decades. See how they manage to reduce their waste while providing superior products for your home and kitchen. Need help sharpening and honing your knife blades? Watch this video to learn a few steps and techniques that will get your blades back to cutting like new! This is the Victorinox factory in Ibach, Switzerland. We've been makes knives and tools here since 1884. Swiss army knives, multi-tools, household kitchen knives, professional chefs knives; we make a lot of knives here. My name is Yvonne, I have worked as a receptionist at the factory for 4 years. Mr. Elsener runs Victorinox. Mr. Elsener great-grandfather started the business and the company has always been run by the Elsener family. They asked me to tell you the story of inventiveness and the science behind how this big factory only uses as much heating oil as this family apartment. Plus how this home along with 114 others is heated by an innovative heat recovery system in the Victorinox factory. First off, let's meet Mr. Erwin Muller, our head of production. Victorinox has always believed sustainability is important to the manufacturing process. This is my father, Reini. Hello, I'm the head of the stamping process. I've been working here for 44 years. The first stage of our knife production process is to stamp out blades or depart from the raw materials. We do this with steel stamping machines and the waste is given back to the supplier for new steel production. The next stage is to harden the blades. Our ovens have a temperature of 1050 degrees Celsius. Our final two stages are grinding and polishing the surfaces of the blade to give them their correct final dimensions. The grinding, polishing, and hardening processes produce a lot of heat. So we use water from our closed water system to keep the machines cool. The grinding and polishing processes produce a steelened water sludge. We filter out the steel and press it with very high pressure into cubes. Then we give the cubes back to the steel supplier. So in the factory we have absolutely no steel waste. The steel sludge recycling process is one of the most innovative things Victorinox has invented in 1980 when my father has worded here 12 years. Since then we have recycled several thousand tons of steel. We need a lot of electricity to power the machines, so we buy environmentally friendly electricity from a hydroelectric power station close to the factory. We recycle the leftover cooling water also. It comes out warm so we use it to heat the factory and provide warm water for our showers, restrooms, and 114 homes nearby. We are proud that our factory only uses as much heating oil as a family home, and that thanks to our sustainable process the carbon footprint of a Swiss army knife is similar to your toast at breakfast. Victorinox encourages all its employees to take a passionate approach to recycling and saving energy. We all take the inventive spirit of Victorinox home with us. 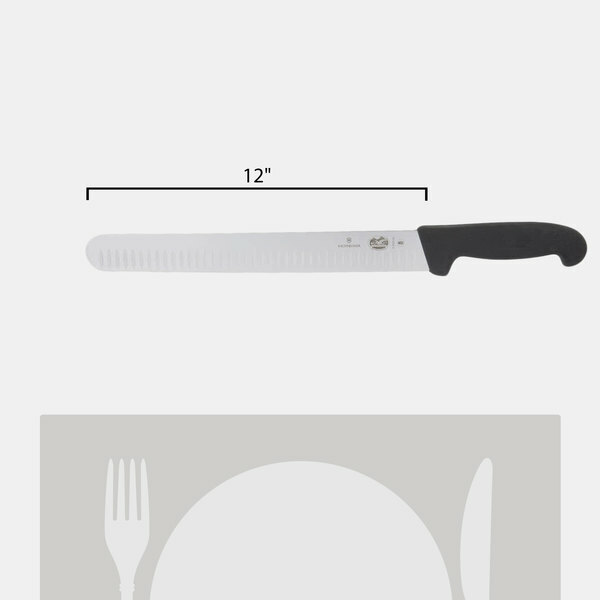 Victorinox is a company producing knives for professional chefs, the foodservice industry, the fish industry, and the retail industry for the last 127 years. All Victorinox knives come with a lifetime guarantee against material and workmanship defects. 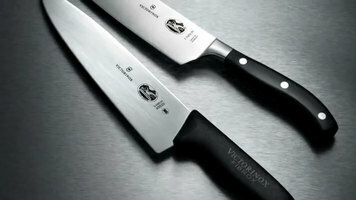 You can depend on Victorinox to give you a lifetime of cutting pleasure and proper food preparation. There are easy steps and techniques to straightening the edge on your blade. The maintenance tool of choice is the butcher steel. Step "A" is called feathering. Feathering is to pull your edge out, to bring it up almost like taking a bird's feather and straightening it. So feathering the edge, you put the edge facing away from you, and you pull it from heel to tip, one, two, three times, and you're pulling edge up. Then the next step is straightening and aligning. You bring the edge to its typical position. The position of holding the knife to the steel is to hold the back of the knife approximately a quarter of an inch up off the steel. That will set the angle of the edge to approximately 15 degrees. And bring it down, heel to tip, in this fashion. Make no more than 2 to 3 strokes. That will allow your edge to come up and be nice and straight and do a great cutting job. If steeling is not what you'd like to do, and you don't feel confident with it, there is a quick and simple method to achieve near equal results. Very simply, with this little device here. It's called the Swiss shop. It's very simple to use. You merely have to put your knife on the counter with the edge facing up. You do have a protective guard that protects you against hitting into the edge with your fingers. You start the device at the heel of the knife and drag it forward to the tip. You do that twice, maybe 3 times if your knife hasn't been maintained in quite a long time, and it will cut a perfect 30 degree angle, which is 15 degrees on both sides of the blade, and it will put it in cutting shape, just like when you bought it. The next procedure is full sharpening of your blade. I have in front of me a 3-way stone unit. This is what's used in most commercial kitchens. You typically dip your stone in the water to get a film of water on the surface of the stone. Now the technique to hone or stone a knife is to be very consistent. First, hold that blade a quarter of an inch off the stone, as you did with the steel. You start from heel and pull to the tip in a slightly arcing motion. Be consistent with your pressure and your stroke from heel to tip on both sides of the knife, making sure to maintain that quarter of an inch angle. It may take several strokes to get the proper thinness, but each time you do it your getting closer to a high-performance edge. When you're finished, go to your steel to just dress, straighten, and align your edge, and you have recreated a brand new, performing edge that is razor sharp. I was skeptical to buy this because of the price, but it was best decision ever. Easily slices through whole rib-eye loin (boneless), and is easily sharpened. Very sharp and does what it is supposed to. Clean smooth consistent cuts. Doesn’t tear the meat and makes for beautiful cuts for presentation. Overall durability and ability to hold an edge is yet to be seen but at this price, I can afford to replace it. I have used this slicer several dozen times now, and have gotten excellent results. 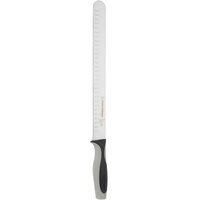 It gives a very clean and thin slice - I have used for turkey, hams, and roasts. The handle fits nicely in my hand, and the blade is well weighted. I bought the Victorinox 47645 12" Granton Edge Slicing / Carving Knife with Fibrox Handle after reading a review on cooks illustrated about building the best ala'carte knife set! i'm very impressed with the quality! I purchased this for home use to carve roasts, smoked meats, and bigger steaks. This was the best price found anywhere...by a lot!! Another use for this knife I have found is for cutting sushi. I am able to take regular sized pieces and cut them in perfectly in half for my toddler to eat. I really enjoy my Victorinox slicer. Directed to get it by Cook's illustrated and the best price was found here. 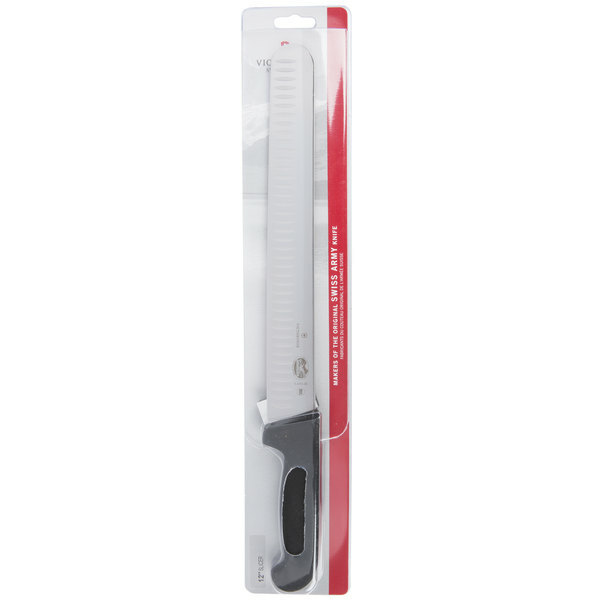 If you want a best in class slicing knife, this is it. This is one of the best slicers I've used over my the fifteen years in the kitchen. All of Victorinox's knives are a great buy. Slicer: 5 out of 5 the 10.25" slicer is an amazing slicer, and was the top pick of review sites. It slices clean and evenly through even fatty meats (like a pork roast) thanks to its grantons. You can also get very thin cuts of meat, it's just simply great. Best price on the Web. 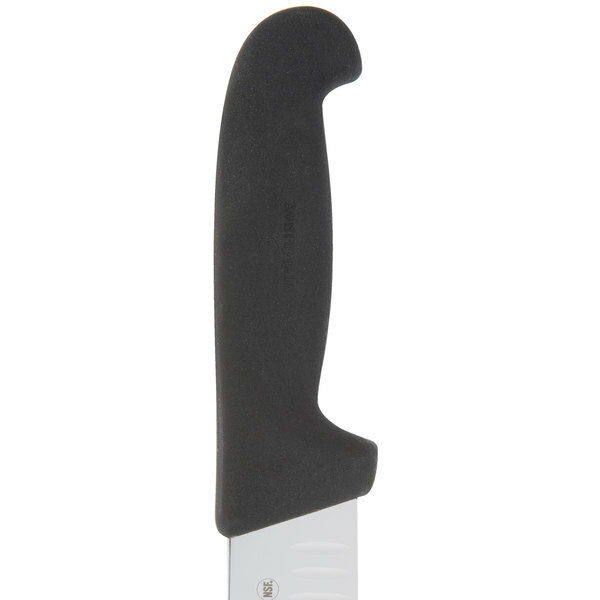 This knife is top-rated by several renowned reviewing sites. Comfortable, well-balanced, and sharp. A great value for anyone serious about his/her equipment. 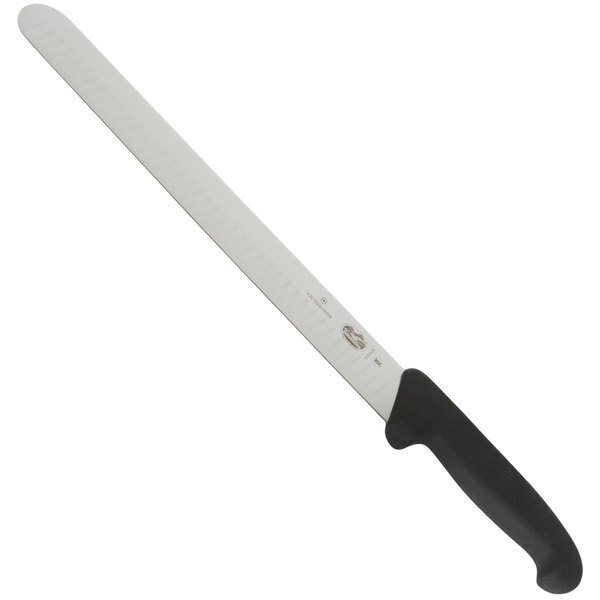 The Victorinox 12" Slicing Knife w/ Granton Edge and Fibrox Handle is WONDERFUL! Great smooth & clean cut on meat. Easy motion. Super price. Better than the knives I have that cost more! 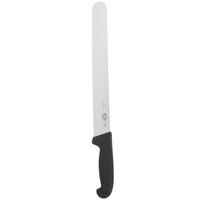 Also love the Mercer M3314P 12"x2"Polypropylene Blade Guard. Victorinox always makes a good blade, they are sturdy and the German style blade-ship helps them stay sharp. 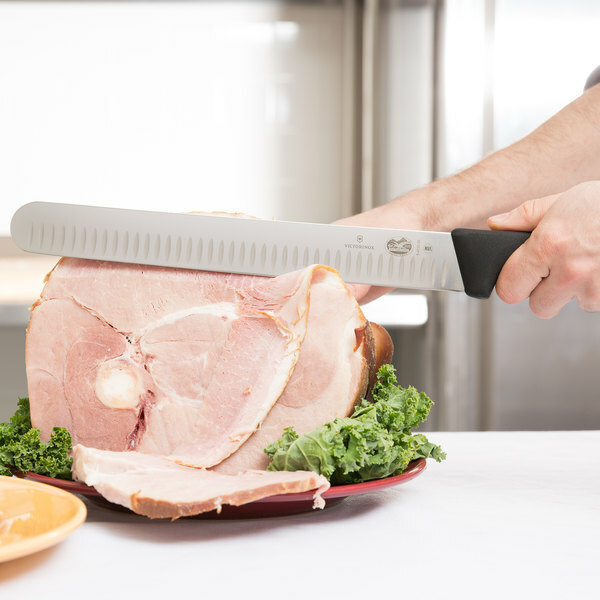 This carving knife is perfect for when we bake whole hams this holiday! 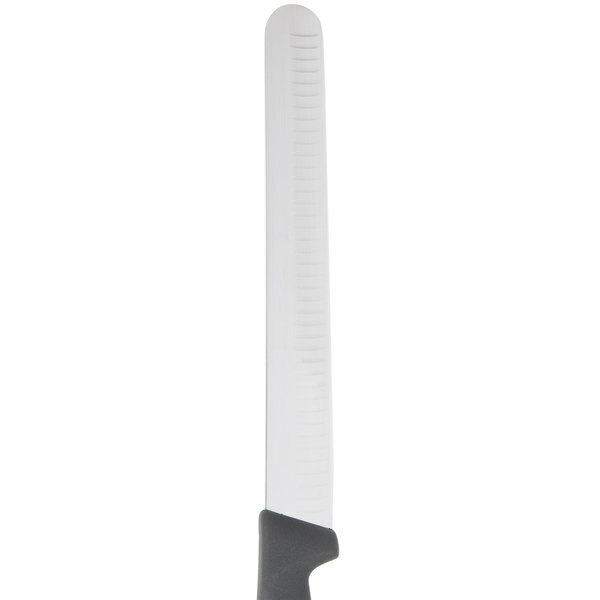 Excellent quality knife.It makes it very easy for consistent appearing slices that we need in the BBQ competitions.I have never been disappointed with Forschner.